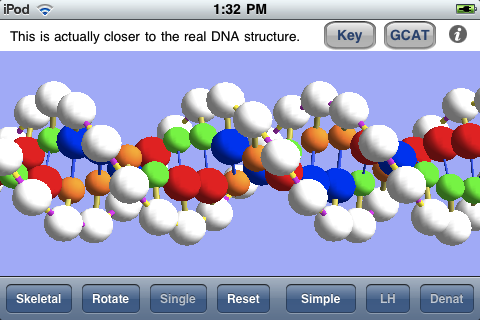 I’m happy to say that OnScreen DNA Lite™ for iPhone can now be downloaded from the iTunes App Store. This is basically a smaller-screen version of the iPad app that was released when the iPad first became available, though adapting the app to the iPhone and iPod Touch required some modifications, which I’ll mention. Everything I said in the blog post “The Thinking Behind the OnScreen DNA Lite™ iPad App” applies to the new iPhone version. The same desire to “provide students (and all persons interested in DNA) with a way to reach a deeper, more intuitive understanding of DNA structure” motivates the development of both apps, and the same care to show DNA’s correct handedness, base-pairs per helical turn, etc. with a ball-and-stick virtual model was taken for each. What’s more, it’s a lot of fun to play with the DNA model through the touch screen control of its orientation and size in both versions of the app. My last blog post, “An OnScreen DNA Lite™ for iPad Gallery“, showed the screen shots that are a part of the iTunes listing for that app and commented on them. As one way of comparing the two versions, let’s consider the corresponding screen shots for the iPhone app. 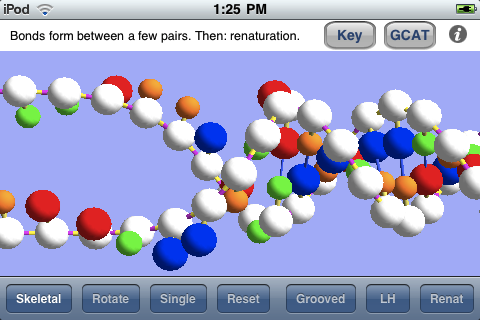 Below is shown a screen shot from the iPhone version in which the linear (“GCAT”) representation of the base sequences of the DNA model is visible below the model. Because of the smaller screen area of the iPhone, this linear representation of the bases is only shown on demand. The button at the top designated GCAT shows and hides that view. Another accommodation to the smaller screen is the shortening of the DNA model. Instead of the thirty-five base pairs of the iPad model, the iPhone version has twenty-one, which is still sufficient to show adequately the full double helix structure and its features. 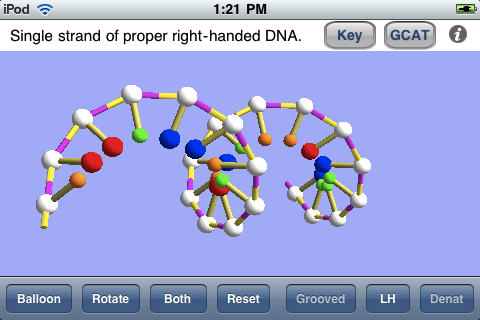 The screen shot below shows the DNA model enlarged (by means of the iPhone pinch-to-zoom technique) and with the linear view of the base sequences hidden. The structure is shown with major and minor grooves as the result of a button tap. 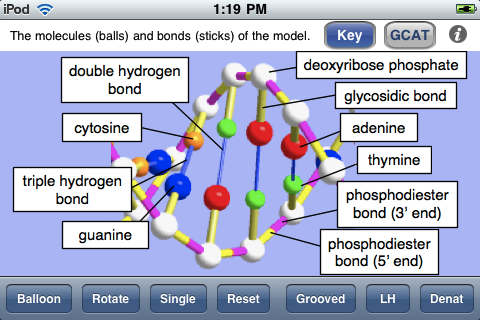 The next screen shot shows the key to the ball-and-stick model, indicating what each colored ball (molecule) and stick (chemical bond) is meant to represent. This is essentially the same view as the Details popover view in the iPad app. 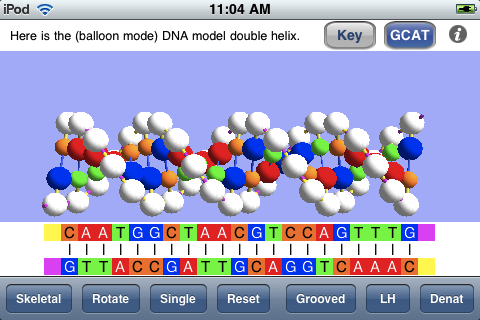 As in the iPad app, one can view a single strand of the DNA model, as shown below. This may be especially useful for grasping the meaning of the handedness of a helix, and the app also allows one to switch back and forth between natural right-handed DNA and imaginary left-handed DNA. The screen shot was taken with the model rotated by means of a finger swipe. The screen shot below shows the simulated process of renaturation (rejoining together of the two strands, separated during denaturation) as it nears completion. Rather than repeat myself, I’ll just refer the interested reader to my previous two posts for more details about the virtual DNA model of OnScreen DNA Lite for iPad and now iPhone and iPod Touch. This entry was posted on Tuesday, May 11th, 2010 at 1:19 pm	and is filed under iPhone Development. You can follow any responses to this entry through the RSS 2.0 feed. Responses are currently closed, but you can trackback from your own site.